Maximum size: about 3 mm. Identification: This is a very small animal that lacks lamellae on its rhinophores. The branchia are absent or very reduced. (Note 1) It's cream in color with a few widely spaced orange spots. Taxonomic notes: It was first recorded in Hawaii from Kaneohe Bay, Oahu by the meiofauna team during MarineGeo in May, 2017. This animal seems to be a Gymnodorid but, due to its unusual features, there's some chance that it could wind up in a different genus with further work. Photo: Katharina Jörger: about 3 mm (photographed when contracted but measured when live): 2017 MarineGeo; found by meiofauna team; Kaneohe Bay, Oahu; May, 2017. 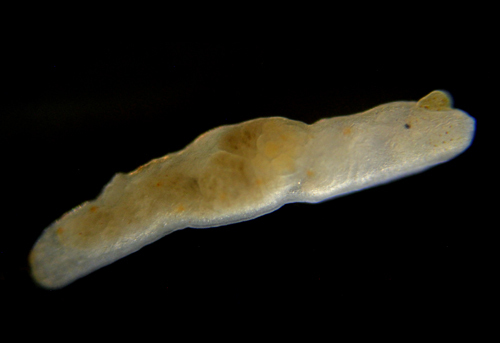 Note 1: CP didn't notice any branchia when observing it under the scope but Katharina Jörger wrote in a subsequent e-mail: "The lack of gills and absence of lamella on the rhinophores (at least I couldn't see them) confused me. That's why I didn't want to call it Gymnodoris at first. But now that I check closely there actually might be retracted small gills at the posterior end". Note 2: Katharina Jörger wrote in a subsequent e-mail: "The specimen was approx. 3 mm and had just swallowed an entire Philine sp. in one piece. It does contain eggs and I believe they are of the Gymnodoris and not of the prey."